Posted on March 9, 2018 at 3:25 pm. This week , we leared about Dr. Seuss and read several of his books! We learned that Dr. Seuss’ real name was Theodore Seuss Giesel, but his father had wanted him to be a doctor, so he called himself Dr. Seuss. 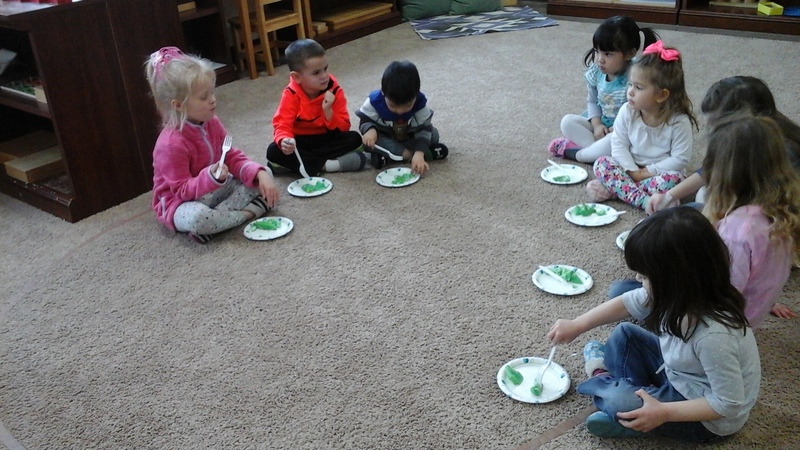 We enjoyed reading “Green Eggs and Ham”, and the children enjoyed taste testing green eggs! We also read “Oh The Places You’ll Go!” and I asked the children where they would travel if they could travel anywhere in the world. My favorite answers were “Target” and “My sister’s Karate class!”. 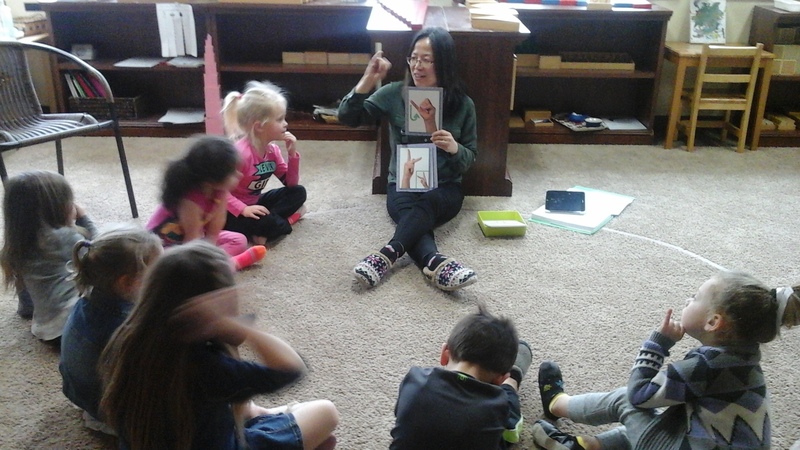 Ms. Mel also practiced Korean with the children during her afternoon group time! 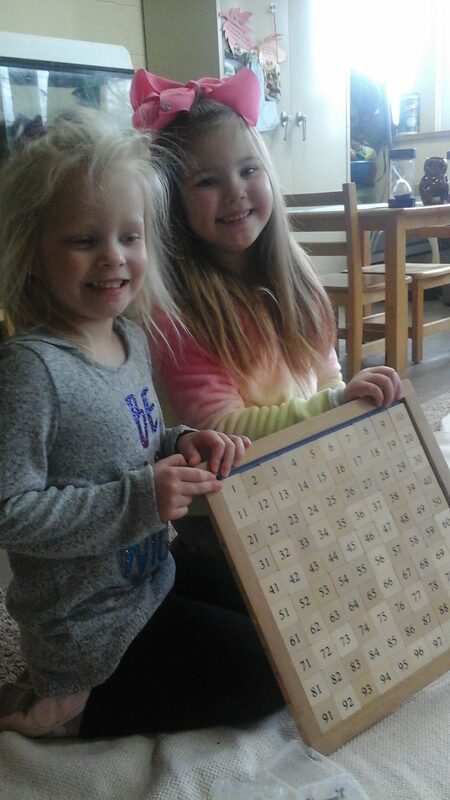 These two friends are so proud of their work on the 100 Board! 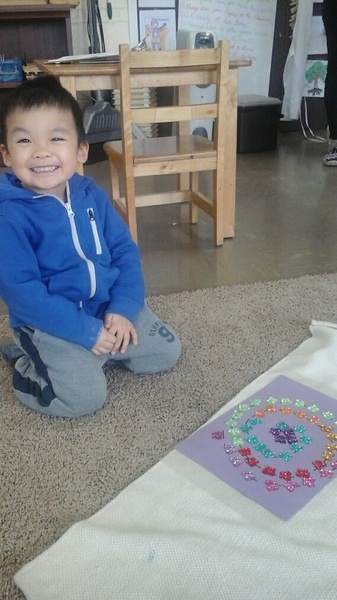 This material is designed to teach the child to count to 100 and the order of numeration! Matching the Geometric Solids to cards that show the shape of their base! This is great indirect preparation for Math! Taste testing Green Eggs from Green Eggs and Ham! They were so good! -What is our State Bird? -What does our state flag look like? Posted on March 2, 2018 at 3:26 pm. This week we learned all about Dental Hygene. We learned that we should brush our teeth in the morning and at night. We also learned that if we do not brush our teeth, we could get cavities! We also talked about how eating candy and sweets is not healthy for our teeth and that it is important to go visit the dentist so he or she can check and make sure our teeth are healthy! 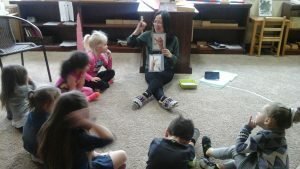 Ms. Mel also practiced some words in American Sign Language with the children during our afternoon group time! 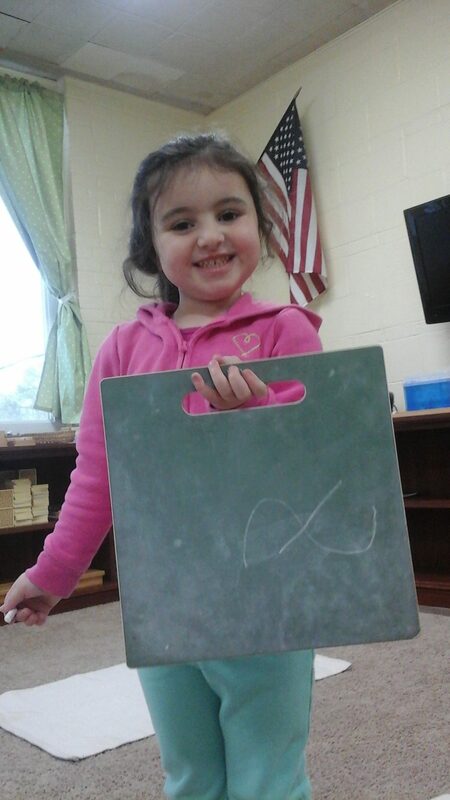 Proud of her work using the Movable Alphabet! This material can be used to match initial sounds to pictures or to phonetically spell words, phrases, and sentences! 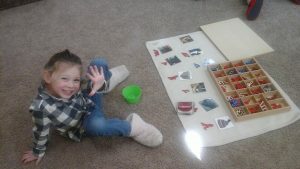 Ms. Mel practiced the alphabet using American Sign Language during our afternoon group time! Working on the Noun Game! When using this work, the child reads the cards and goes to fetch the noun written on the card! 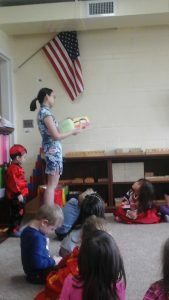 -Reading Dr. Seuss stories and learning about his life. Posted on February 23, 2018 at 4:28 pm. This week, we learned all about the Presidents! We learned that the President of The United States has the important job of running our country. We learned about the first president, George Washington. We read the story, “Dear Mr. Washington,”, which was about the artist who painted George Washington’s official portrait and his children. Apparently the artist felt George needed to smile more in his painting because he was too serious! We also learned about Abraham Lincoln, the 16th president, and how he wanted every everyone to be treated fairly. Ms. Mel also worked with the students on learning some Italian this week! 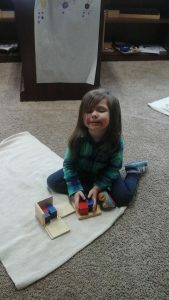 Working on the Binomial Cube! Did you know this work indirectly prepares your child to learn Algebra? 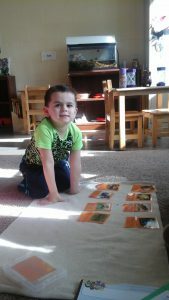 Working on the Cards and Counters Material from the Math Area! This material teaches the child to match quantity to symbol and it also indirectly prepares the children to learn the difference between odd and even numbers! -What foods are good for our teeth? -What is a dentist’s job? Posted on February 16, 2018 at 3:14 am. This week was full of fun as we dicussed the Winter Olympics and different Winter sports! The children enjoyed learning what the Olympics are and learning what sports are in the Winter Olympics. We have also been tracking how many medals the United States has won so far! Ms. Mel and Ms. Yao (Ryan’s mom) also shared with us about Lunar New Year! Ms. Mel explained about how each year is represented by an animal in Korean and Chinese culture and that 2018 is The Year of The Dog. 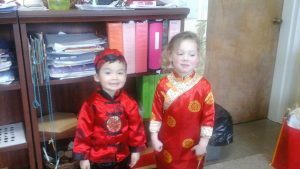 She even taught the children how children bow to their elders on Lunar New Year and receive money from their elders and Ryan’s mom shared with us how children in China buy all new clothes to begin year. Ms. Yao also gave the children a red envelope with a chocolate coin and told them that for New Year’s, children in China receive a red envelope from their parents which contain money. So much fun! We also had so much fun at our Valentine’s Day Party! Thank you to all the parents who brought in the needed items for our party and to those who took time out of their day to help make our Valentine’s Day Party so much fun, including activities for taller and smaller kids, such as the best bounce house for toddlers and many other activities. Working on the 100 Board from the Math area of the classroom! 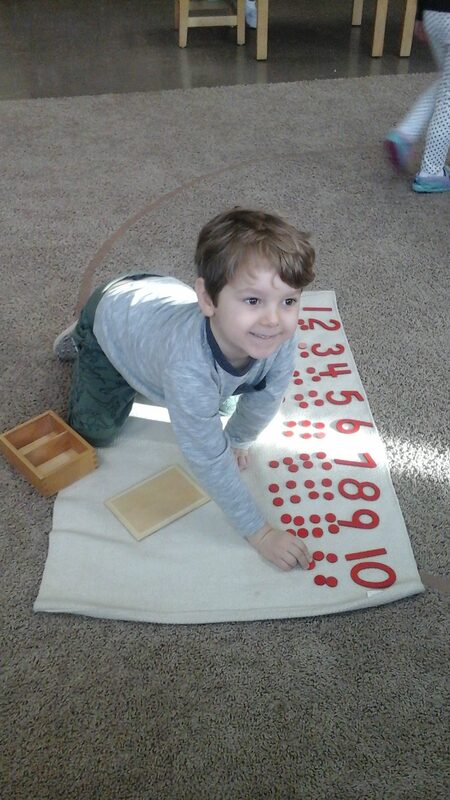 The child places the numbers from 1-100 on the board and through repetition, discovers the order of numeration. 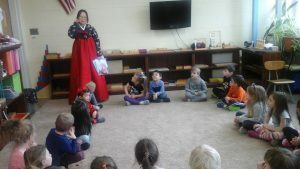 Ms. Mel dressed in a traditional Korean dress! 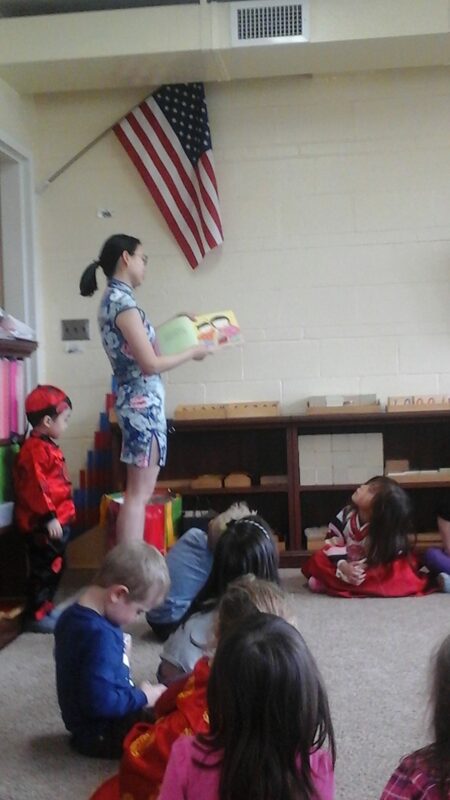 Ms. Yao read us a story about a traditional Chinese Lunar New Year! Some of our friends also had the opprotnity to try on some traditional outfits worn on Lunar New Year! Working on the Parts of The Flower Puzzle from the Cultural Area of the classroom! Puzzles are a great pre-reading material! -Who was the first President of The United States? -What is the job of the President of The United States? Posted on February 9, 2018 at 3:30 pm. This week we learned all about Transportation! 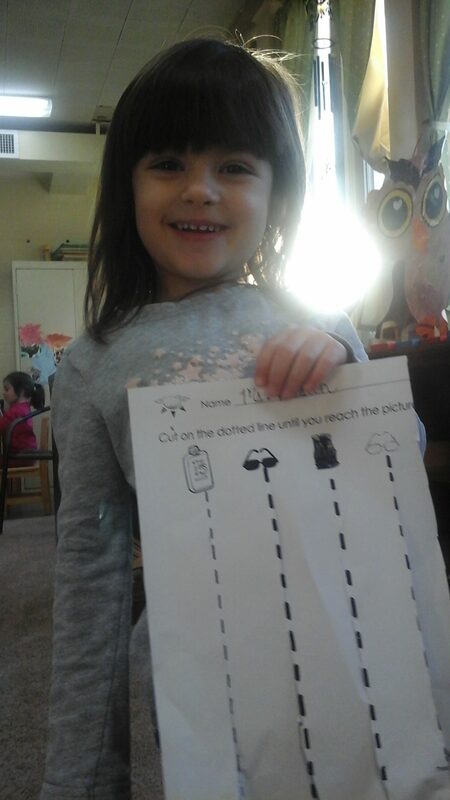 We learned about the different way we can travel through air, on land, or in water. The children enjoyed learning the song, ” Down By The Station” and singing other songs about other forms of traveling. 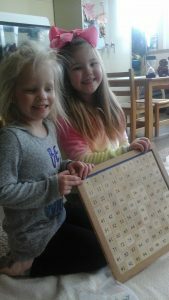 Ms. Mel also practiced some phrases in German during our preschool afternoon group time! Working on the Note Naming material from the Music section of the Cultural Area and learning to name Middle C through G! 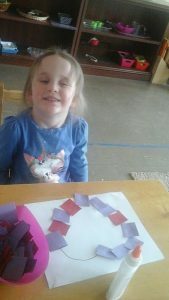 Practicing her gluing skills by making a Heart Mosaic from Art section of the Cultural Area of the classroom! Working on the Stone Placement material from the Practical Life Area of the classroom! 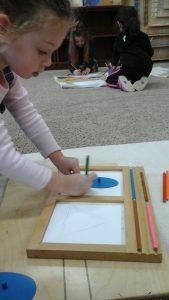 By placing the one stone on each dash on the paper, the child develops their sense of order, concentration, and coordination. 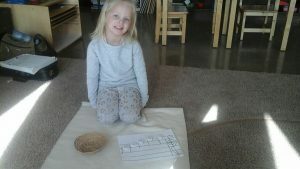 Also, this helps indirectly prepare the child as they begin to count and use materials in the Math Area. Posted on February 2, 2018 at 3:21 pm. This week was so much fun as we dove into learning about the Five Senses! We learned that our senses are Taste, Hearing, Smell, Sight, and Touch.We learned that our senses are very important to helping us discover and learn more about the world around us! We explored our sense of Hearing by playing our Silence Game we normally play during our morning line time. During the game, a candle is placed in the middle of our circle and the children and teachers sit as silently as possible. 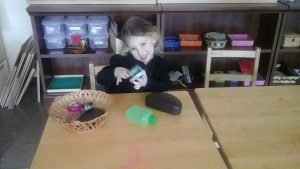 Before we started our Silence Game this week, I asked the children to close their eyes and, while they were sitting in silence, listen to all the sounds around them. The children also enjoyed taste testing jelly beans and guessing which flavor jelly bean they were tasting. So much fun! Working on the three part Amphibian cards! This material in the Science area also is great preparation for reading, as the child matches the pictures and the names of the animals! Working on the Weaving Material from the Practical Life Area. This material helps the child to develop their sense of order, concentration, coordination, and independence. Also, by weaving from left to right, the child is being indirectly prepared for reading! Proud of her cutting work! -Learning about different ways to travel. -Learning songs about different ways to travel. Proud of her cursive letter “x”! Writng on the chalkboard is a great pre-cursor to writing on paper! 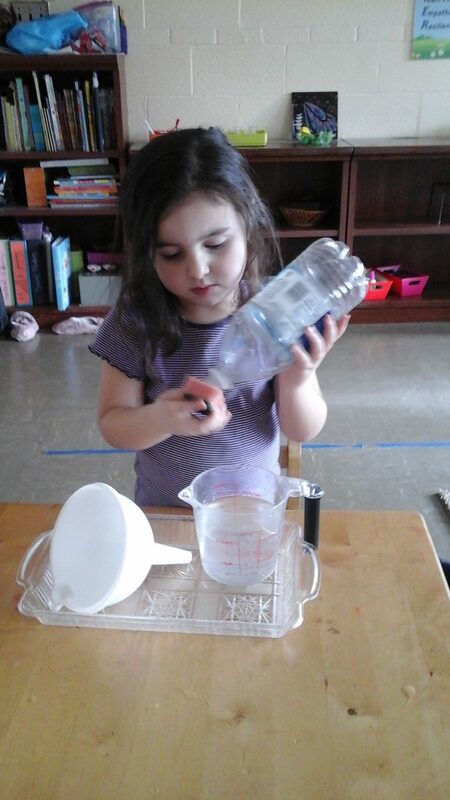 Practicing Opening and Closing Containers! 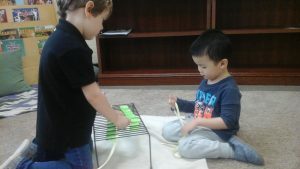 This material helps to promote the childs independence! Working on the Memory Game from the Math area of the classroom! 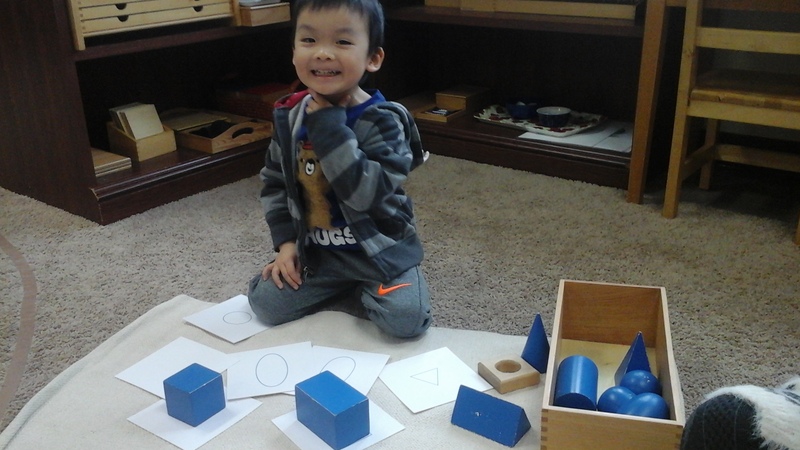 This material aids the child in practicing their quantities and symbols 1-10! -All About Our 5 Senses. -Learning about how the different parts of the tongue help us to taste. 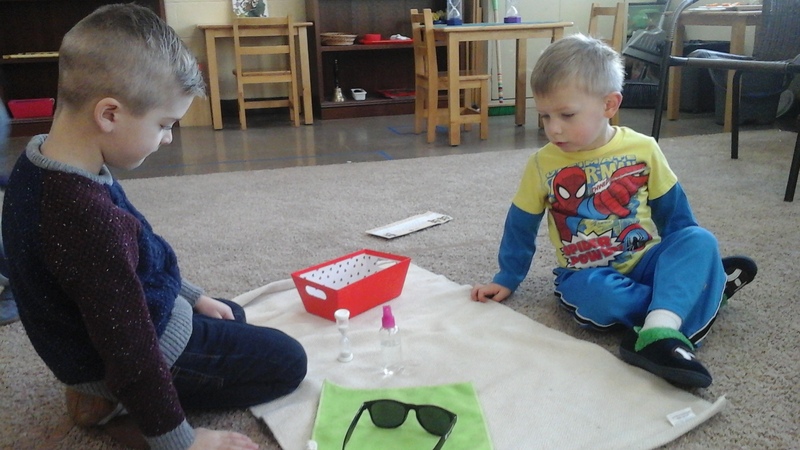 -Playing the “Mystery Bag Game” to explore our sense of touch. Posted on January 19, 2018 at 3:03 pm. This week, in our class, we have been learning about Peace Makers and how we can be a Peace Maker as well! We learned that a Peace Maker is someone who is kind to others, is respectful of others, helps others, and takes care of others. We learned about Martin Luther King and how he believed everyone should be treated fairly. We also learned about Mother Teresa, who spent her life in India taking care of those who were sick and those who were poor. 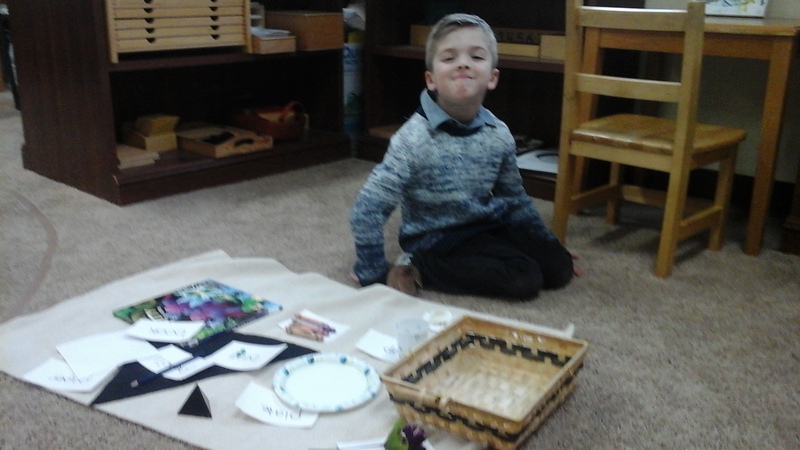 We also learned about Maria Montessori, who believed children were the key to achieving world peace and without whom, we would not have a school. We also discussed how we can be Peace Makers in our school and at home as well! Proud of her creation using the Pink Tower and Brown Stair together! 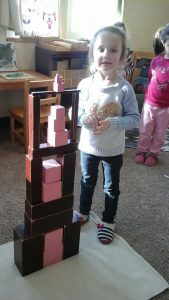 Both the Pink Tower and Brown Stair are wonderful Pre-Math material, as the child learns to build from biggest to smallest and it is indirect prepartion for counting to 10! These two friends are working together on the Polishing Sunglasses work from the Practical Life Area of the classroom! This material is designed to help develop the child’s sense of order, concentration, coordination, and independence! 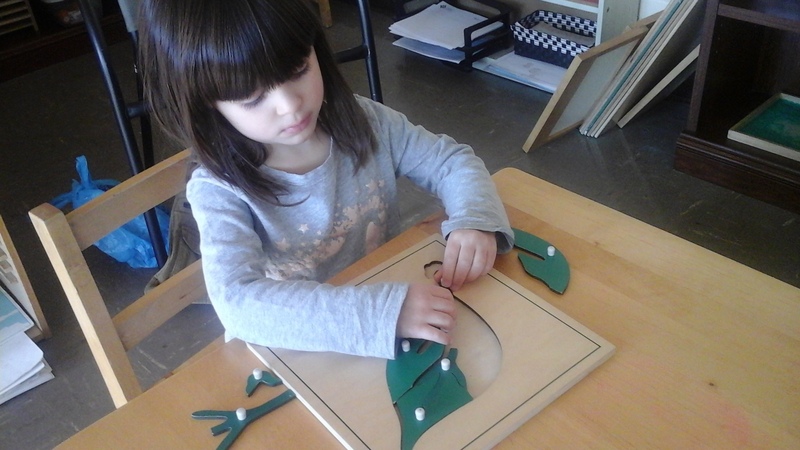 Focused on completing the Parts Of The Leaf Puzzle! This material is a great Pre-Reading activity! -Learning about the differenence between unhealthy and healthy food. Posted on January 12, 2018 at 3:15 pm. We have had a wonderful week getting back into our classroom routine! We took this week to review our classroom rules and routines. The children also made paper snowflakes to decorate our bulletin board with Ms. Mel and reviewed how to great one another in Korean and learned the names for the parts of the body in Korean as well! 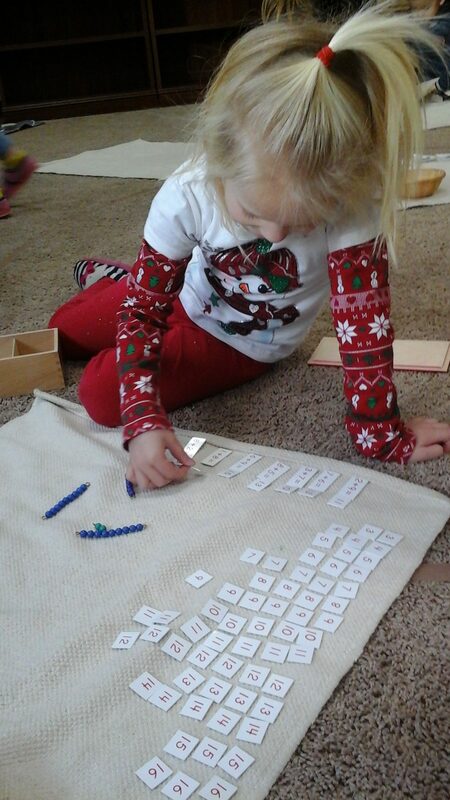 Working on Addition With The Colored Beads! This a a concrete way for the child to practice addition and to begin to memorize some addition facts! Working on the Parts of The Tree three part cards! 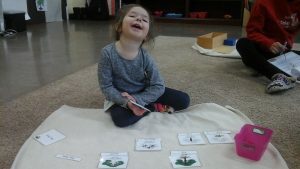 By using this work, the child increases their vocabulary and by matching the words and the pictures togegher, begins to prepare their mind for reading! Working on Pouring Through a Funnel! 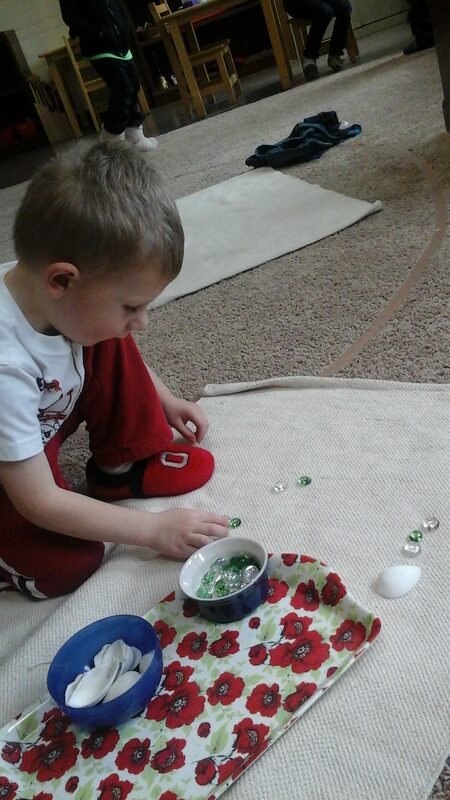 This material helps the child develope their sense of order, concentration, coordination, and independence! -Learning about Martin Luther King Jr. , Mother Teresa, Maria Montessori, and other Peace Makers. -Learning how we can be Peace Makers too. Posted on December 15, 2017 at 3:07 pm. Our week was filled with fun and excitement as we learned about Musical Instruments and The Orchestra! The children learned that an orchestra is made up of several different families: The Brass Family, The Woodwind Family, The Percussion Family, and The String Family. The children also enjoyed preparing for their on musical performance at The Christmas Show! Our class seems to really love music and many of them actually sing while they work! I have a feeling we may have quite a few future musicians in our class! Tracing the Sandpaper Letters! 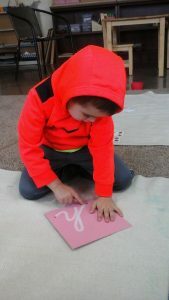 By tracing the Sandpaper Letters, the child experiences the letter sound and symbol several different ways by seeing, touching, and hearing their teacher say the letter sound. 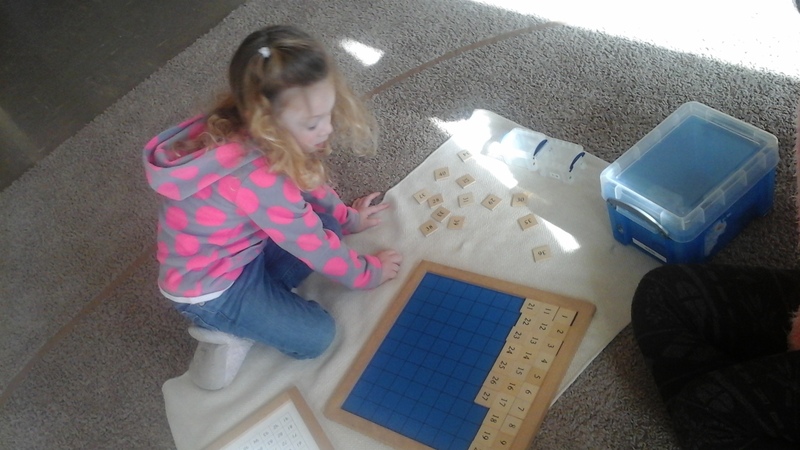 This also helps the child prepare for letter formation later on when they begin to write! Practicing tracing the Metal Insets! 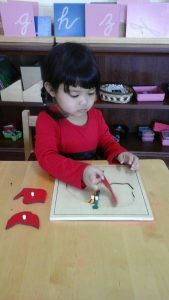 This material helps the child steady their hand for writing and promotes the development of their focus and concentration! Working on dusting the shelves! 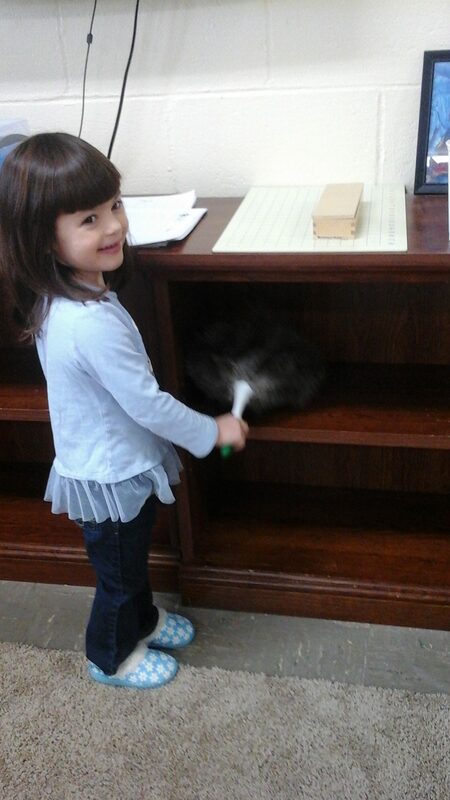 In the Montessori Classroom, your child learns to take ownership of their environment! -Crazy Hair Day on Tuesday! -Pajama Day and Pizza Party on Wednesday!